“Mumma, you have so many dark spots!! Put some cream”. My world shook as my 4-year-old said that to me (trust me, this did happen and I have no clue where he learned this from!) But in a way, he wasn’t wrong. Ageing, hormonal changes, stress and a hap-hazard lifestyle have been destructing my skin. It had been too long since I had been ignoring it but yes, my skin was aging, dying and spotting. Mamaearth is a brand that does not need an introduction anymore. A brand that always thinks about the minutest problems mothers face, and curates products accordingly has recently launched Mamaearth Bye Bye Blemish Cream. I happened to sample the cream on my skin. I have used the Bye Bye Blemish cream for about 15 days and here is my Review for the same. I have oily skin, with minimal to no breakouts. My skin is usually very clear, with a slight layer of oil that works like gleam. I usually avoid using any cream or lotion on my face due to my skin type. I also, often do not require any cream treatments. I occasionally apply some moisturizer during winters, when I feel that my skin has dried out too much. I do not have any remnant marks from the ‘pimple’ days. However, due to aging and recent changes in skin, I have developed slight pigmentation. Even though it is visible to others only when they look very closely, it is visible to me. The Mamaearth Bye Bye Blemish cream is suited for all skin types. It contains power ingredients like Mulberry Extract, Organic Daisy Flower Extract, and Vitamin C. The cream claims to be able to fight melanin deposits and reduce blemishes or dark spots. It is MADE SAFE certified, which is an international certification that the product is free of harmful chemicals. The Bye Bye Blemish cream from Mamaearth comes in a cute-sy tiny jar. It has a pump mechanism to give out about a medium sized drop of the cream. Usually, one dot is sufficient, unless your skin is really drying out. The cream is lotion like – white in color. The texture is smooth and soft. It absorbs quickly into the skin. Simply pump the bottle to get out a small quantity. Apply the cream in gentle circular motion on a cleansed face. the cream gets absorbed within seconds. It is recommended that the Mamaearth Bye Bye Blemish cream should be used twice a day, on a cleansed face. I used it once a day, before bedtime, as that is the only few minutes I get to myself. The cream definitely lives up to the expectations. After the first week itself, my spots began to lighten. The Blemish cream from Mamearth did not make the skin very oily or greasy, which is a big thumbs up! It has a mild fragrance, that gives out odors of natural ingredients. It may not be the most pleasant, but it is definitely not laden with artificial perfumes. Another thumbs up there! It did, however, take away some smoothness of the skin. The skin appeared slightly coarse after application from Day 1. But my skin is a bit sensitive to any kind of cream, so that could be a reason. The product is available in a single size package. I give a 4 out of 5 to the cream. I’m taking away a point simply because my skin did get a little coarse after using it. But that could be the problem of my skin, not of the cream per se. Totally depends on the kind of skin you have! I recommend the cream to my readers and would like to hear their experience of using the cream. 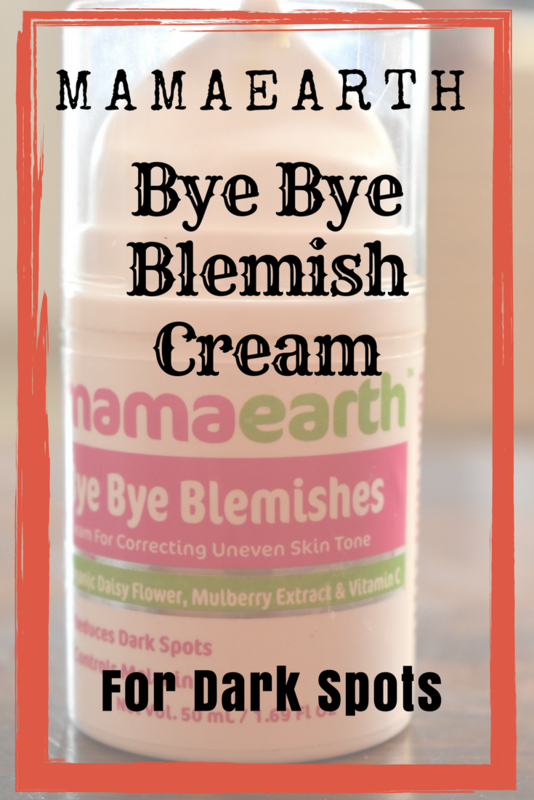 If you liked the review of Bye Bye Blemishes Cream from Mamaearth, Do SHARE this post! By coarse do you mean that this product initially irritated your skin? Dude, I love Mamaearth products too. The only con people said was this is kinda huge bottle and a turn down while traveling. Although like you said non-greasy and mild fragrance covers up everything 🙂 I’m gonna buy this next for my mommy! the major highlights for me were – light, easily absorbed and non greasy. i have oily skin and these are my go to points before choosing any product. I have been using this cream from past few days and I’m expecting it to help me clear my skin. Mamaearth is a well known brand for moms and kids products and I totally love them. Mamaearth is a well known brand for moms and kids products. I have used a fewnof their products from kids range and I totally love them. Need to try out these too. I am thibking to buy few products from mamaearth since everyone is talking about it. Please tell me which are their best onea. I have heard amazing things about the brand. Pigmentation comes with age and i see some spots developing on mine too even if i take care of myself so much. I would love to try this cream too. This cream looks really interesting. I have got hyperpigmentation problems too and would love to give this a try. It made your skin coarse because your skin is sensitive. I also have sensitive and oily prone skin, should I give this cream a miss?